We analyzed 320 offers to find the best lease deals in April. This month, automakers are offering perks like special discounts for coming from a competitor, plus Sign & Drive leases requiring $0 at signing. In some cases, choosing a larger vehicle may equate to a better value. In addition to our top picks, we also have a complete list of every lease deal that you can filter based on segment, payment, etc. Offers listed here are manufacturer lease examples, but you may be able to negotiate even better prices. Not seeing deals for your particular area? Leave us a comment below with your zip code and preferred vehicle type and we'll do our best to help. Interested in Leasing? We’ve helped customers so far today get an unbelievable lease offer. We can help you too with just a few simple questions. 2 What is your First & Last Name? Deep discounts: With over $2,700 in discounts and an effective cost of $238/month, the Forte LX-S is one of the cheapest cars you can lease. That's considerably more affordable than the Honda Civic LX ($250) and Nissan Sentra SV ($260). Get an upgrade: Looking to get more for your money? 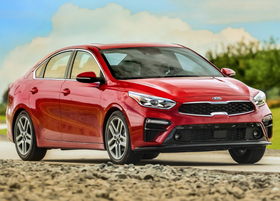 The Forte S is $1,100 more expensive on paper but just $10/month more to lease because of slightly better discounts and a lower interest rate. $10 more than a Jetta: It may be hard to believe, but better discounts actually make the Tiguan S just $10/month more expensive to lease than the Jetta ($249). 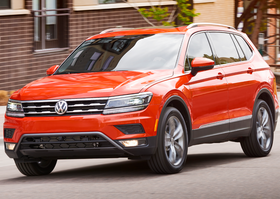 When you consider that the MSRP of the Tiguan is over $4,800 more expensive, it's clearly a superior value when leasing. Sign & Drive: Like most VW leases this month, this is a Sign & Drive promo that involves $0 due at signing. Although you'll still have to pay taxes & fees, the key advantage over competitors is that the deal requires no first month's payment. Over $3,700 in savings: Deep discounts help make the Sportage very affordable to lease. With an effective cost of $286, it's $30/month cheaper than the Honda CR-V ($316) and nearly $70 less than the latest offers we've seen on the new Toyota RAV4 ($355). 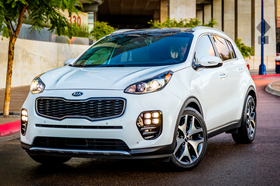 Smarter to lease than the Soul: Although the MSRP of the Kia Soul is over $5,600 lower on paper, the Sportage ends up being just $21/month more expensive because of better incentives ($286 vs. $265). 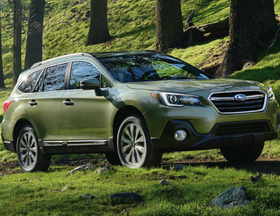 High residual: Subaru doesn't offer a ton of discounts, but a residual value of 60% helps make the Outback 2.5i a smart choice to lease. Coupled with an interest rate of approximately 1.3% and you're looking at one of the best SUVs to lease for about $300/month. Cheaper than Forester: Even though its sticker price is over $2,000 more expensive than the 2019 Forester, the Outback ends up being $11/month cheaper to lease ($301 vs. $312). The Forester was recently redesigned and has a higher interest rate. Over $8,000 in savings: The Acura TLX continues to feature some amazing discounts for leasing. 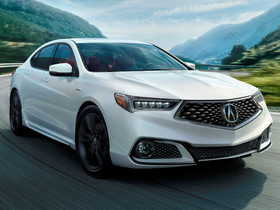 The turbocharged 4-cylinder TLX with Tech Package benefits from $8,250 in incentives, resulting in an effective cost of just $384/month. That makes it just $16 more than a base TLX ($368) despite a $3,700 difference in MSRP. Undercutting everyone: At $384, the effective cost of the TLX is $56/month less than the Lexus IS 300 ($440). Next to mainstream models like the Honda Accord EX ($367), the TLX is just $17/month more despite having an MSRP that's over $9,100 more expensive. 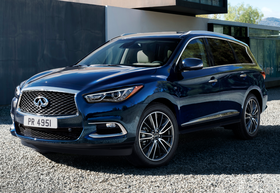 Cheaper than a QX50: Once again, the QX60 ends up being cheaper to lease than the smaller QX50 despite a nearly $5,000 difference in MSRP. The QX60 PURE has an effective cost of $491/month, giving it an $8 advantage over the QX50 LUXE ($499). At that price, the QX60 is actually $1/month cheaper to lease than the 2019 Acura RDX ($492). The vehicles may have a $6,850 difference in sticker price, but better discounts help make the QX60 a much better buy for those looking to get the most for their money. 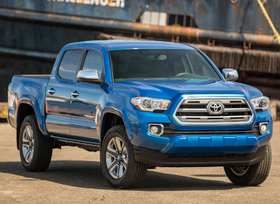 Over $100/month cheaper than Colorado: The Tacoma's high residual value often makes it an excellent truck to lease. The SR5 4x2 Double Cab can be leased from as little as $259 for 36 months with $1,999 due at signing. That comes out to an effective cost of $315/month. At that price, the Tacoma is $137 (per month) cheaper to lease than the 2019 Chevy Colorado LT 4x4 Crew Cab ($452). It may be hard to believe, but our analysis finds that it's even more affordable than the aging 2019 Nissan Frontier SV Crew Cab ($425). $1 cheaper than a Civic: With an effective cost of $249/month, the Clarity Electric is one of the cheapest EVs you can lease. That makes it $1 cheaper than a Civic LX ($250) despite an over $16,000 difference in MSRP. 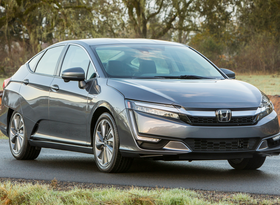 It's even less expensive than the Clarity Plug-In Hybrid ($412). Additional benefits: In California, the DMV offers single-occupant use of carpool lanes. You can also apply for a $2,500 Clean Vehicle Rebate. Note that unlike competitors, Honda's lease doesn't include the ability to purchase once your contract is up. Here are the cheapest leases with the lowest effective monthly cost factoring the term, payment and amount due at signing. The effective cost is the advertised payment and amount due at signing represented as a monthly cost, before taxes & fees. Browse all leases by segment based on the latest information.